Q1: I've been hearing so much news about the problems that bees and other pollinators are having these days. What's the deal, and what can I do to help? Q2: My lawn is full of holes from bees burrowing in it. What should I do? Q3: Large black and white or yellow and black bees are nesting near my house (spring or summer), or getting into my house (fall or winter). What are they and how do I get rid of them? Q3a: There are honeybees in the walls of our house. I hate to have them killed. How can I find someone to remove them live? A: Visit these websites for information about how to get rid of bees Adkins Bee Removal; Master Bee Control. Q4: Large bumble bees are swarming and buzzing around my hedge, and I'm afraid to trim it. What should I do? Q5: What is the big bee that looks like a little hummingbird? Q6: A large, slender black bee is nesting in holes in wood, and it's not a Carpenter bee. I've never seen it before. I live in the Southeast USA. What is it? Q7: How can I find out what species of Osmia (or other bees) are nesting in the trap nests that I put out? Q8: Do you have any information about school projects involving pollen bees? Q9: Do you have any suggestions for school projects involving pollination? Q10: How do I hand pollinate vegetables in my greenhouse? Q11: The bees that I purchased were lethargic when they emerged. What was wrong? Q13: Are orchard bees affected by the mites that kill honey bees? Mites are killing my orchard bees. What can I do? Q: My lawn is full of holes from bees burrowing into it. I'm concerned for my kids and pets, and I'm reluctant to mow. What should I do? A: Particularly in the spring, it is not uncommon for Andrenid bees (genus Andrena), or plasterer bees (genus Colletes) to appear in large aggregations in lawns and bare ground. These are solitary ground nesting bees. Solitary bees are much more docile than social bees; they won't attack, and they rarely sting unless you step on them or handle them. Social hymenoptera colonies (e.g., honey bees, yellow jackets, paper wasps and hornets) have only one individual, the queen, who lays eggs. She's usually deep inside the colony where you can't see her, and she is well protected. Other individuals are workers, and they will defend the nest, even at some risk of being killed in the process, because they are expendable. In contrast, each female solitary bees makes her own nest; she is less likely to defend it aggressively because she would be more likely to be killed and would not be able to reproduce. The females can sting, but generally only do so if you pick them up or step on them or something drastic. Usually their stings are much less painful than social bees and wasps; more like a pin prick. You may see some bees hovering over holes, and others actually entering the holes. The former are males waiting for females to come out in hopes of mating with them. The females usually come and go from the nest quickly because they spend most of their time foraging on flowers. Thus, you will see more males than females floating around the nesting area. Males can't sting, so they pose no risk. Generally these bees only fly for a few weeks in the spring, and then their holes disappear. You may see them again each year at the same time for a number of years, or their aggregation may not last for more than a year or two, depending on the soil conditions that attracted them and how these change. My advice is to leave them alone; just don't walk barefoot around the nesting area while the bees are nesting. They are unlikely to sting your kids or pets, and you should be able to mow without disturbing them very much. If you mow early in the morning or in the evening there is less bee activity, and thus less opportunity to disturb them. In fact, I suggest that you spend some time with your kids sitting nearby and watching the bees come and go from their nests. Try to figure out how they dig their holes, what plants they are visiting for pollen and nectar (and pollinating in the process); observe how male and female behavior differs. Each hole is the entrance to the nest of a different female bee. How does each female know which hole belongs to her? How long does it take her to collect a load of pollen? This is a good opportunity for you to help your kids develop an appreciation for nature. If you really must get rid of them, tilling the ground usually destroys their nests and the next generation. Q: I have a nest of bees that I have never seen before. They are shaped like wasps but have black bodies and black and white checkered area near the stinger. What are they? Q: We've been bothered by enormous bees getting into our house at night. They are obviously attracted by light. Can you tell me what these are and any other information on how to get rid of them? Q: We found a large cream and black striped, hairless bee. It was fat, not thin like wasps. It was in a hole on its side under a piece of tree bark. It was quite stunning. What kind of bee is it? How can I find out more about it? A: The "bees" in question are not bees at all but social wasps. The bald-faced hornet (black with white markings), yellow jackets, and paper wasps (yellow and black markings) are three common social wasps. In social wasp colonies there is a queen in the nest laying eggs, and workers who are her daughters foraging for food and defending the nest. 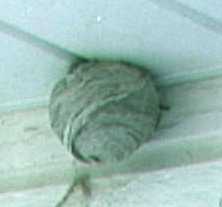 Social wasps often build their nests in trees or under building eaves. Some build nests in cavities in the ground. The structures are made from chewed wood pulp. 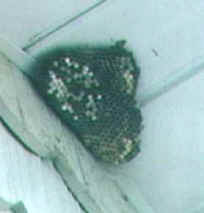 Paper wasp nests consist of a layer of comb cells attached by a stalk to a substrate. Hornets also make layers of papery combs, but the combs are covered with a papery envelope. The colonies can get quite large, and their occupants will defend the area near the colony by stinging intruders. Hornets and yellow jackets are more aggressive than are paper wasps. Furthermore, when these wasps believe they are being attacked, they release a chemical odor, an alarm pheromone, that alerts other workers to attack. So it can be painful if you get close to the nest. The best way to discourage social wasps from making a nest is to find it early in the season when there are only a few wasps present. Either dislodge the nest structure (which is very small at this time) with a long pole at night when the wasps are too cold to attack, or use a spray can of insecticide made specifically to spray long distances into social wasp colonies. If you find a nest during the summer when it is already large, don't try knocking it down, or you will have many angry wasps coming after you. If the hive is close to places where people are likely to be, such as near a door or on a low tree branch where people walk, you may want to hire an exterminator to get rid of it. Alternatively, you could try using the pesticide spray cans that are designed to kill wasp nests from a distance. If the hive is high in a tree or near some part of a house where people don't usually get close, then you would best leave it alone. If the wasps are foraging around your yard, they are probably taking pest insects as prey for their larvae, and are therefore very beneficial for your garden. They are not likely to sting while they are foraging as long as they are not disturbed. Most of the colony will be killed by the first frost; the colony will not survive the winter. Only new queens, produced in late summer, will survive the winter to start new colonies next year. Watch for them to start their nests in the spring, and destroy them while the nests are small. In the fall, next year's queen wasps search for a place to overwinter. rather like hibernating, such as under a piece of bark. Some may come into your house to look for overwintering sites. At this time of year many of the wasps that you see are males, which don't sting, and won't live long. Males have longer antennae than females. If they enter your house, either kill them with a fly swatter, or if you are a compassionate person, catch them in a clear plastic bag and release them back outside. Read more about stinging insects around the home, and see photos, at the Aacute Pest Control Web site and the Bee Identification Chart. Stinging insect fact sheets from Cornell University. Read about hornets, yellow jackets, paper wasps and other wasps in The Audubon Society Field Guide to North American Insects and Spiders. Read about the social behavior of wasps in The Insect Societies by Edward O. Wilson, 1971, Belknap Press of Harvard University. Visit these websites for information about how to get rid of bees Adkins Bee Removal; Master Bee Control. Copyright © 2000, Karen Strickler. All rights reserved.